To quantitatively evaluate a FCS experiment, one has to exactly know the shape and the size of the confocal volume. The problem is that the confocal volume sensibly depends on numerous parameters of the optical set-up, refractive index mismatch of the sample solution and the objective’s immersion medium, coverslide thickness variations and especially the dependence on optical saturation of the fluorescent dye, which can occur at even very low excitation powers. In contrast to conventional FCS dual-focus FCS (2fFCS) is robust against these FCS artifacts thus allowing to measure absolute diffusion coefficients. This is achieved because instead of the size and shape of the confocal volume 2fFCS uses the distance between two confocal volumina as a reference. 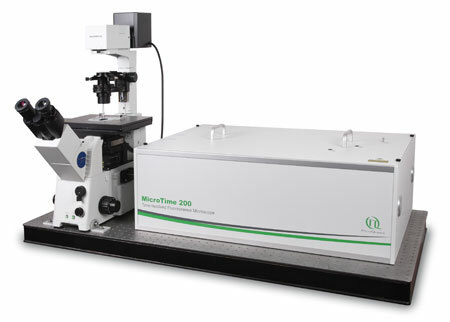 The 2fFCS set-up is based on a specificly modified MicroTime 200 confocal microscope. 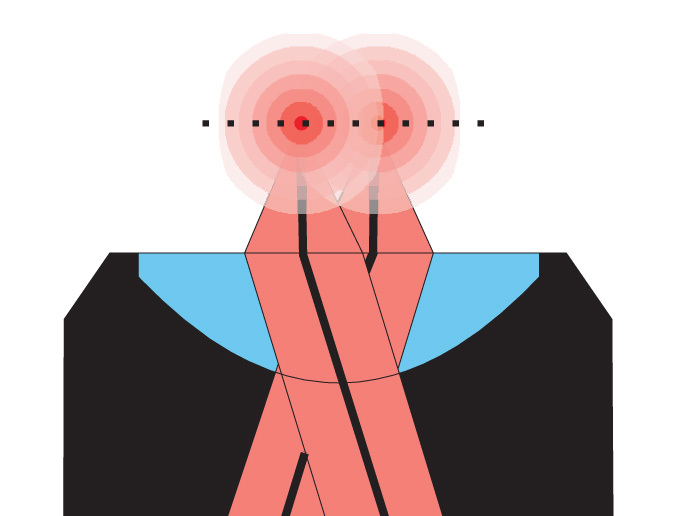 To generate the two shifted foci, two orthogonally polarized, pulsed diode lasers are combined with a polarization sensitive beamsplitter and afterwards coupled into a polarization maintaining single-mode fibre. At the fibre output the light is again collimated by an appropriate lens. Both lasers are pulsed alternately (Pulsed Interleaved Excitation, PIE). The combined light consists of a train of laser pulses with alternating orthogonal polarization. 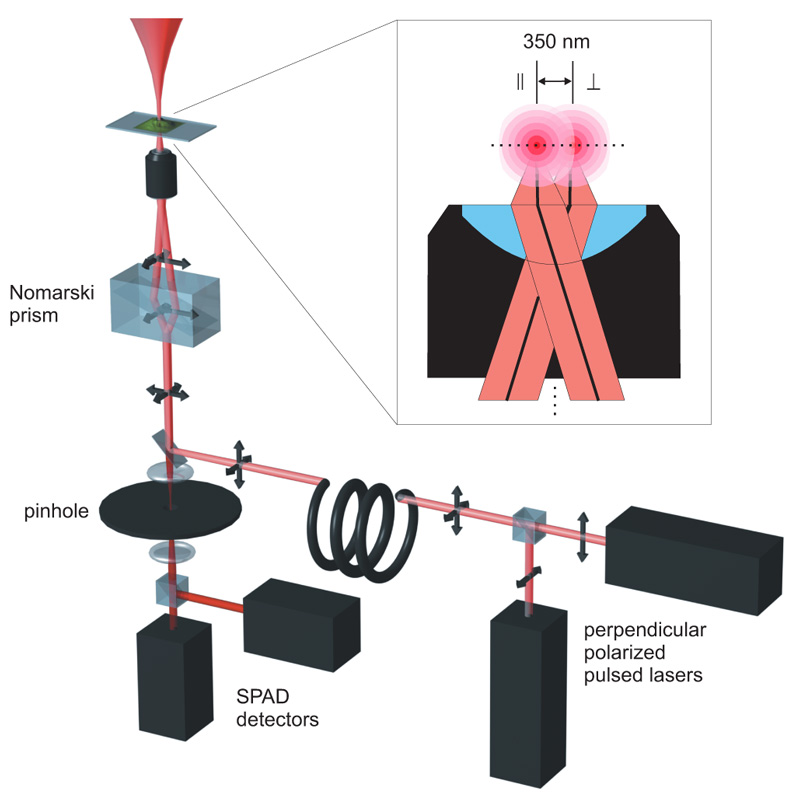 Before the objective the laser beam passes through a Nomarski prism. The principal axes of the Nomarski Prism are aligned with the orthogonal polarizations of the laser pulses, so that the prism deflects the laser pulses in two different directions according to their corresponding polarization. After focussing the light through the objective, two overlapping excitation foci are generated with a small lateral shift between them. The distance between the beams for a given wavelength is defined by the DIC prism and the objective. As long as these two elements are used, the distance will remain accurately constant over time. A TCSPC-unit is used for data acquisition, operating in the time-tagged time-resolved (TTTR) mode, which allows to record for every detected photon its arrival time with a temporal resolution in the nano-second range (macroscopic time) and its arrival time with respect to the last laser pulse with picosecond timing resolution (TCSPC time). The TCSPC time of each recorded photon is used to determine in which laser focus/detection region the fluorescence light was generated. Thus, for each laser focus the corresponding autocorrelation function can be calculated. In addition to the autocorrelation curves, one can also correlate the fluorescence signal from one laser focus with that of the second focus. The shape of an autocorrelation curves is completely determined by the confocal volume(s), whereas the shape of the cross-correlation curve is also dependent on the overlap of the two foci. If the distance between both lasers is known, a global fitting of both auto- and cross-correlation curves yields the absolute diffusion coefficient. This is because the relative time shift between the cross correlation and auto correlation curves scales with the square of the foci distance divided by the diffusion coefficient. Moreover, the relation between cross-correlation and auto correlation amplitudes is a direct measure for the focus overlap. The big potential of 2fFCS is demonstrated by the monitoring of the conformational change of calmodulin during calcium binding. CaM belongs to the family of calcium-binding proteins and is a key component of the calcium second messenger system. This small, acidic protein (~16.7kD) is ubiquitous in all eukaryotic cells and can bind up to four calcium ions. To date the calcium loaded form is known to regulate the functions of about 100 diverse target enzymes and structural proteins. Here, the Stokes radius is measured as a function of the free calcium concentration. The results give direct evidence to the existence of an intermediate Ca2+-CaM conformation and prove that 2fFCS is able to monitor smallest changes in hydrodynamic properties of bio-molecules. The diffusion coefficient of Atto655 labeled CaM at different calcium concentrations was measured with 2fFCS at 25°C. For the whole set of measurements the corresponding Stokes radii were derived from the estimated diffusion coefficients. At very low calcium concentrations (16 nM) CaM is in the apo-conformation, whereas at high calcium concentrations (0.5 - 2 mM), CaM is calcium saturated and adopts the Ca2+-conformation. Between the apo- and the Ca2+- conformation a rise in Stokes radius of up to 23.7 Å at 3 μM free calcium can be observed. This rise in Stokes radius is attributed to a conformational change of CaM upon calcium binding and an associated rearrangement of the hydration layer. Above 3 μM, the Stokes radius is decreasing down to 22.8 Å. Since the calcium binding constants range from 0.2 μM to 40 μM under comparable conditions, it is likely that we monitor an intermediate conformation of CaM where only some of the binding sites are occupied by calcium ions, but not all. Comparing the observed biphasic behaviour with published results, it is most likely that this change in conformation can be attributed to the formation of Ca2+- CaM.